In May 2016 we were contacted by our client who had seen an advert in Garden Rail Magazine. They were looking for someone to design and install a G Scale Garden Railway around an existing established pond and waterfall. 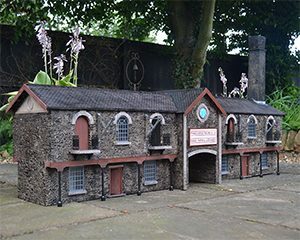 Although our speciality is in the design and manufacture of bespoke model buildings and kits we felt this project could expand our knowledge and understanding of what goes into garden railways and how they can enhance their surroundings, becoming a part of the garden rather than a stand-alone structure. To find out more please visit our Bespoke Projects page. As our show develops we are always adding new buildings to show the different methods of construction and design of our models. This impressive warehouse in low relief sits behind the viaduct next to the steam-up area. If you would like to visit our showroom please contact us and we would be happy to make arrangements for you to come and see us. At the beginning of the year we met Andrew Mountfield at Peterborough. 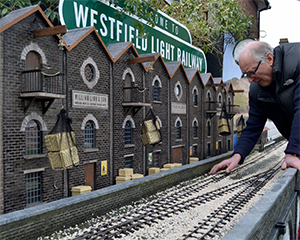 He had seen our new low relief warehouse and was so impressed that he commissioned us to build him a new warehouse for his layout in France. The two story warehouse has sliding and opening doors, fully working cranes and even a chimney. The warehouse is now installed and fits in well with its surroundings. 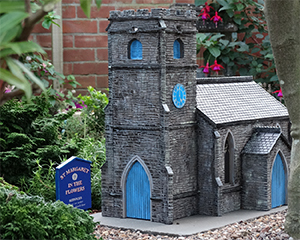 Having met Pat and John Budd at the National Garden Railway AGM at Peterborough we were delighted to help with their quest to find a model church suitable for their 16mm garden railway. 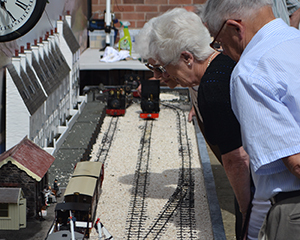 Pat and John had a special reason for having a church for their garden railway. John’s sister Margaret loved to see the railway and in particular a section that was filled with colourful flowers, so when she passed away they thought it would be a fitting tribute to place her ashes in a container constructed from mirror glass with a top decorated with crystals and black edging surrounding her photo, inside the model of the church in which she was christened and married and can be viewed through the church window. Although our collection of models continues to grow we had not created a church so this was an ideal commission for us. Pat and John provided detailed dimensions and proportions for us to work to because the model church needed to fit in a specific area of their garden. Armed with this information a detailed drawing and costs were provided for approval before making the cardboard prototype. All Brunel Models are developed in this way to eliminate any errors and to make sure the final models are accurate and easy to assemble. After sending photos of the prototype to Pat and John we were very pleased with their comments; WOW!!!! The prototype is even more than we could have dreamed, just how fantastic will the completed model be! It confirms our choice of creators based on what we experienced at Peterborough. After prototyping the components were machined out on our in-house CNC machine. All the components are made from outdoor grade signage materials so your model can be left outside all year round. The components were then assembled and glued together using industrial strength super glue. Although our models can be supplied in flat-pack format Pat and John asked us to fully assemble and paint the model for them. All Brunel Models are painted by hand if required to specific colours and finishes. In addition to the model of the church Pat and John asked us to make a church notice board with the words “Saint Margaret in the Flowers” We were happy to add this important detail as part of the cost. 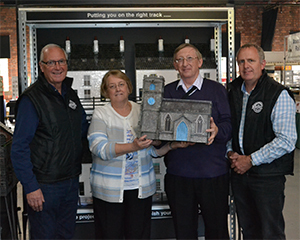 On completion of the church model we arranged to meet Pat and John at Elsecar Heritage Centre in September. 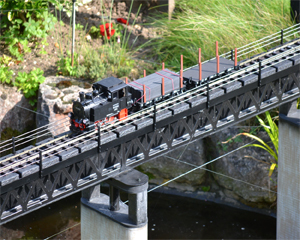 They were very happy with the finished results and It now stands proudly in their garden railway. Michael McDonald found an advert in Garden Rail for a Brunel Models, they were life savers. 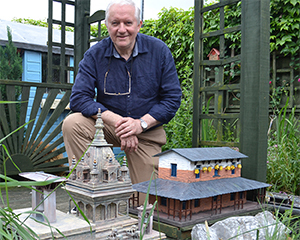 After accepting their quotation to build the temple and house Simon from Brunel Models called into a local Gurkha restaurant to be told that the very temple had been destroyed and that only the steps remained. 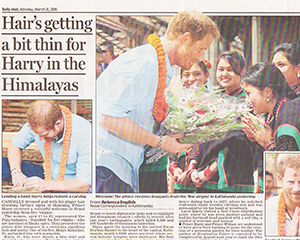 Sunday evening news 20th March saw Price Harry in Durbar Square looking at the very ruins, and the news report continued with a witness account of someone’s mobile phone showing the temple crumbling during the tremors. Detailed drawings were produced prior to making the models and Michael was kept up to date with photos of the progress. The models are made from exterior grade materials so they can be left outside all year round. During manufacture Simon fabricated the tower tops using some decorative beads plus the two temple bells which actually ring, these were purchased from a pet shop, the larger one for a parrot and the smaller one for a budgie’s cage (now that is clever and come totally unexpected !). Now the completed temple and house are installed, albeit in miniature in his garden he is amazed the design skills which can only be described as phenomenal. The attention to detail is stunning. Brunel Models first International Order! 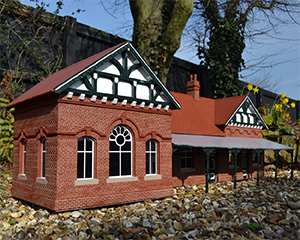 One of our most popular model kits is based on Chelfham Station which is on the Barnstaple to Lynton railway. 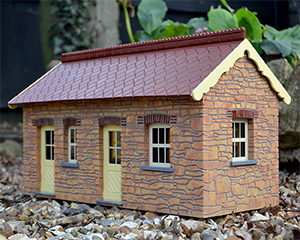 We received an email from a customer based in Australia who had seen our models on the website and was keen to purchase one of our Chelfham Station 16mm kits, fully assembled and painted to match his particular colour scheme. 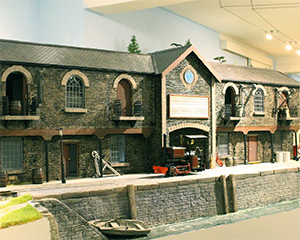 The model was cut and assembled in our workshop and detailed using photographs supplied. It was then carefully packed and shipped directly to the customer who was very please with the final result. Our latest commission has been a challenging but very rewarding one. 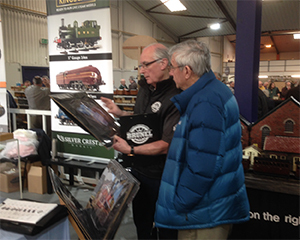 Our client visited us at Elsecar Garden Railway Show in September 2015 and asked if we would be interested in quoting to build several models of the Port Erin station building, water tower, engine shed and museum. After looking at the project carefully it soon became apparent that a detailed survey and photographs would need to be done. After agreeing the price we arranged for flights and accommodation to carry out the survey just before Christmas. The next stage was to draw up the buildings using CAD software and produce full size prototypes. After a visit to the client’s home we discussed any alterations before moving onto the final manufacturing of the fully weatherproof models. The models were primed in our spray shop and then detailed. 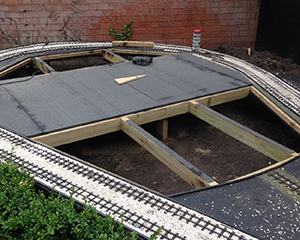 Although the project is not quite complete we thought it would be a good point to let you know how we are progressing and we will displaying all of these models at The National garden Rail Show on Saturday 9th April. Our stand is located on Market Street so please pop along to take a look. 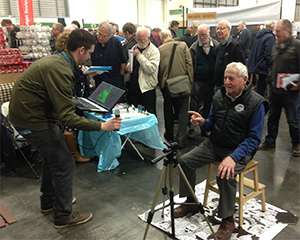 At this year’s Peterborough exhibition the staff at Brunel Models got a full body scan by ARD Digital. Here Maurice is being scanned ready for a miniature figure to be printed at 1:19 Scale using a 3D Printer. As part of our marketing campaign we exhibited at Warwick where we met many interesting clients requiring bespoke commissions which we are currently working on. 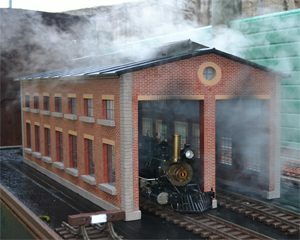 Business Partner Andrew Mitchel is selling his 16mm Indoor Layout. If you would like to know more please visit our Products page. In August we opened our showroom for friends, club members and potential customers to view our latest models. A good day with over 30 people visiting us during the day. 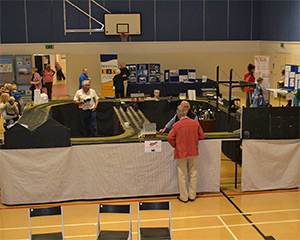 People were invited to run their own engines on the day which worked well and gave the new double track layout a good work-out! 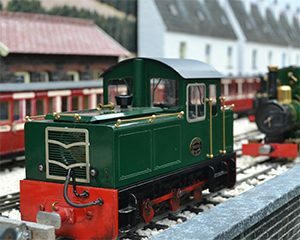 Over the summer we have been busy making several improvements including construction of a large covered area of the layout which will allow us to display the next batch of new buildings for 2017. If you would like to see more photos of the improvement please visit our Gallery page.